Windows 7 beta (or beta 1) is possibly been released in January or February 2009 which Keith Comb has even mentioned in a comment on his TechNet blog (has since been removed) that “we (Microsoft) are targeting to have the DVD’s in the materials from 1/13/2009 on”. With the imminent arrival of Windows 7 beta 1 milestone build, any build version that is leaked or made know publicly can be of ‘beta quality’ (means can be released as beta build). 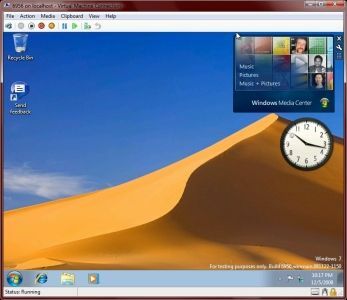 Windows 7 build 6956, which is been showcased during WinHEC 2008 in Beijing recently, is one such candidate. Desktop font no longer has problem when using Desktop Slideshow as background wallpaper rotator. A lot more new desktop background wallpapers. New Windows 7 start screen. Increase in the Windows Experience Index which is now ranging from 1.0 to 7.9, which can be hacked to change the score. New icons for some programs, such as Task Manager, even the options icons inside it are updated. No more Quick Launch bar. Media Center gadget now works properly, and then MediaCenter gadget is of bigger size with new initialization setup screen. Right click on running application button or icon on Taskbar will open Jumplist. Last but not least is that the confirmation that Windows 7 build 6956 will be similar (not a lot of differences) with the beta version that going to be released, or in fact can be the beta version itself. This version of build also include a “Send feedback” link, which probably reflect that the build, or slight variation of it is intended for outside of Microsoft consumption. Good news is that the ‘stolen’ Windows 7 build 6956′ has been released to Internet for everybody to download, albeit it’s not in installation DVD or ISO format. The currently available Windows 7 build 6956 is in VHD format, a virtual hard disk meant for virtual machine. Which means no installation required to try out Windows 7 build 6956. However, things is not as easy. Other than users will require Virtual Server 2005, Hyer-V HyperVisor or Windows 7 Disk Management to load the VHD image (although Virtual PC VPC 2007 can support VHD extension format, it’s unlikely you will be able to run the VHD), the VHD image is preloaded with drivers with may incompatible with other computers, causing the Windows 7 OS inside the VHD fails to load and can’t properly boot up. Of course, there are ways to fix to upgrade existing installation of Windows 7 build 6801 or hack to install Windows 7 build 6956 from VHD, but before any error can be fixed, the VHD image must be downloaded. Here’s the torrent file to download the much anticipated Windows 7 build 6956 with all features already unlocked, unlike Windows 7 build 6801 which requires BlueBadge hack tool to unlock hidden protected features. Update: Windows 7 build 6956 setup installation ISO image has been released, and can be download via torrent or HTTP. The download size of the VHD compressed in RAR archive format is 1.82 GB.